The remains of Australian outlaw Ned Kelly will be handed to his descendants for burial more than 130 years after he was hanged for murder. 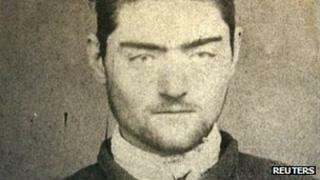 The headless remains of Kelly, who led a gang in Victoria in the late 1800s, were identified last November through DNA tests. The bones were found in a mass grave outside the former Pentridge Prison. The site's property developers wanted to keep the remains but Kelly's family wanted the bones returned. State officials have issued a new licence for exhumation, which means that the developers will not be able to keep the remains for display in a museum, Australian media reported. "The Kelly family will now make arrangements for Ned's final burial," Ellen Hollow, a great-granddaughter of Kelly's sister, said in a statement. "We also appeal to the person who has the skull in their possession to return it... so that when the time comes for Ned to be laid to rest his remains can be complete." Ned Kelly was seen by some as a cold-blooded killer and by others as a folk hero who fought colonial authorities. The bushranger killed three policemen before being captured in Victoria in 1880 and was hanged for murder at Old Melbourne Jail in November of the same year. But his body went missing after it was thrown into a mass grave. The bodies in the grave were transferred from the prison to Pentridge Prison in 1929 and then exhumed again in 2009. The exploits of Kelly and his gang have been the subject of numerous films and television series, including a portrayal by Rolling Stone Mick Jagger in a 1970 film.